Born in 1907 in Edinburgh, McCall studied at Edinburgh College of Art under David Foggie, DM Sutherland and SJ Peploe, and at the Academie Colarossi, Paris. In 1936-37 he was awarded Travelling Scholarships and visited France, Italy, Holland, Germany and Spain. From 1940-46 he was commissioned in the Royal Engineers, working mainly on camouflage. Since the war he lived in London exhibiting in the Royal Academy, Royal Scottish Academy and Glasgow Institute. He was a member of the New English Art Club and Royal Institute of Oil Painters. 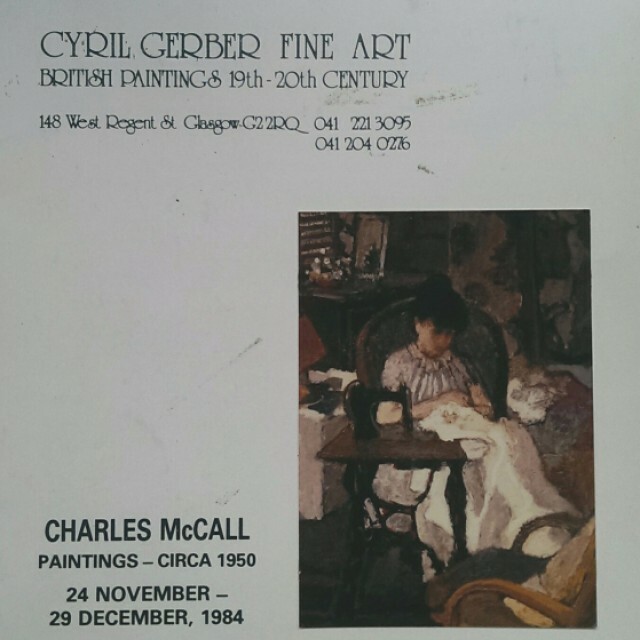 McCall had numerous solo exhibitions in places such as Leicester Galleries, London; Waddington Gallery, Dublin; Duveen Graham Gallery, New York; Crane Gallery, Manchester; Walter Klinkhoff Gallery, Montreal; Alexander Fraser Galleries, Vancouver and Cyril Gerber Fine Art, Glasgow. Peploe's influence has remained strong throughout his career. But even more noticeably McCall is one of a quite small number of less insular Scottish artists who sought and absorbed the influence of such masters as Bonnard, Vuillard and Degas in developing their own style. His work has not been widely seen in Scotland, and we hope that this exhibition of his 1950's period will provide a better opportunity of seeing and appreciating his paintings.